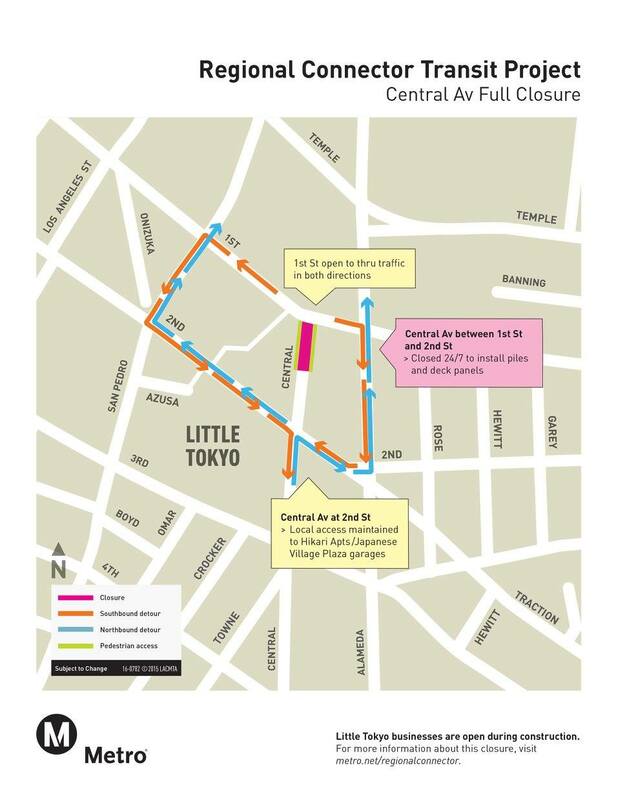 A two-week full street closure of Central Avenue between 1st Street and 2nd Street in Little Tokyo will begin the morning of Saturday, November 7. The closure is required for construction work on the future 1st Street/Central Avenue underground station, one of the three new stations being built as part of the Regional Connector project. Construction work for the Central/1st Street station of the Regional Connector Transit Project, will begin at 7 a.m. on Saturday, Nov. 7 requiring the full street closure of Central Avenue between 1st. Street and 2nd Street. The closure will last approximately two weeks. The closure is needed as construction crews begin pile drilling work for the future station and street decking installation. Anticipated hours of construction work will be from 7 a.m. to 11 p.m., 7 days a week. Construction activities will include saw cutting, trench excavation, survey of underground utilities, backfill, pile drilling and the installation of steel piles and temporary street decking. During construction work, local access to Japanese Village Plaza and Hikari Apartments parking garages will be maintained at all times at the 2nd/Central intersection. Thru traffic along 1st Street will be maintained during this activity. The sidewalks on Central Avenue just south of 1st Street may be intermittently restricted during construction work. Local pedestrian access to businesses will be maintained at all times. The east side crosswalk to the 1st/Central intersection may be restricted as well. Northbound Central Avenue thru traffic will be detoured at the 2nd/Central intersection: right onto 2nd Street, left on Alameda Street, to 1st Street; or left onto 2nd Street, right on San Pedro Street to 1st Street. Southbound Central Avenue thru traffic will be detoured at the 1st/Central intersection: westbound 1st Street traffic will be detoured left on San Pedro Street, left on 2nd Street, right onto southbound Central Avenue; Eastbound 1st Street traffic will be detoured right onto Alameda Street, right on 2nd Street, left onto southbound Central Avenue. Access to businesses and driveways will be maintained and pedestrian access will be maintained outside the construction zone. Emergency access also will be maintained at all times. For more information about the Regional Connector Transit Project and for construction updates, visit metro.net/regionalconnector. Stay informed by following Metro on The Source and El Pasajero at metro.net, facebook.com/metroregionalconnector, twitter.com@metroconnector and twitter.com/metroLAalerts and instagram.com/metrolosangeles. I believe that the future Central/1st Street station, will be the most shallow in depth, and thus,the only station of the Regional Connector WITHOUT A MEZZANINE? Is this a good or bad thing from any standpoint? Aren’t shallow stations without mezzanines common in subways back east? I remember reading that L.A. has some of the deepest metro stations around. Most cities tend not to dig as deep as we have. I guess for reasons related to soil and safety. What is up with the MTA and it’s contractors that now require full street closures for two weeks? At no time do I remember any full closures lasting several days while the Subway was being built. It was all late night closures lasting until the early morning the next day. Is the inconvienece of those who live and work in Little Tokyo less important than this misguided light rail project that is being built only because of the poor management at the MTA? It’s a redundant line that pretty much duplicates the Red Line into Union Station. Mean while those experiencing total grid lock on the Westside are ignored. Nope. Not redundant. Allows for much longer light rail lines, and through service without having to transfer to the Red Line, which goes to a completely different destination (Hollywood/North Hollywood).